The Delhi Development Authority (DDA) was created in 1955 under the provisions of the Delhi Development Act “to promote and secure the development of Delhi”. The DDA has responsibilities for housing, infrastructure, and commercial and leisure facilities. The DDA Master Plan was formed in 1962 to ensure an organized and structured development of haphazard growth of Delhi. This included identification of new land that can be developed into residential properties and make self-contained colonies by providing ample commercial office and retail complexes as well. Qualification: Degree in Civil/ Electrical/ Mechanical Engineering or equivalent from a recognised University/ Institution. 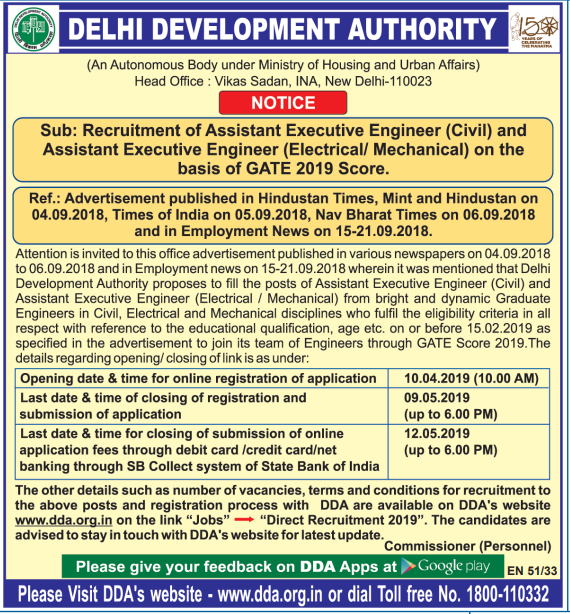 The selection process of Delhi Development Authority proposes to fill the following posts of Assistant Executive Engineer (Civil) & Assistant Executive Engineer (Electrical/Mechanical) Engineers through GATE Score 2019. All interested and eligible candidates apply for AEE Vacancy in online through DDA website (www.dda.org.in) from 10th April 2019 to 9th May 2019.